Engage Mutual originated in 1995, merged with Family Investments in 2015, at which point they changed their name to OneFamily. The insurance provider remains a mutual organisation, meaning it doesn’t have shareholders to pay dividends to each quarter. It’s run for the benefit of its members. Another insurer in the mix is Staysure, which are headquartered in the UK, with offices in Europe too. They’ve built a name for their themselves as the experts in the Over 50s market. OneFamily is partnered with Staysure to provide that insurance plan. So, you could say that in a way, it’s OneFamily who are the experts. The point is, the Over 50s Guaranteed Life Plan from OneFamily isn’t something that sprung up out of thin air a few years back. They’ve been around since 1995 and have partners throughout the UK and Europe who know the Over 50s market. So, off the bat, there is an element of trust there given they have been around for a while. If you try to research the firm OneFamily online, you’ll have limited information. For research purposes, you’d need to delve into Engage Mutual, Staysure and OneFamily. They’ll have been around and trading under some name, likely before you got home broadband and a Wi-Fi enabled smartphone. To save you the hassle of digging up twenty-odd years of information, we’ve gone through what OneFamily are offering and detailed it here in this review. It’s a Whole of Life insurance plan. Not term insurance so policyholders are guaranteed a cash sum pay-out when they die. Another guarantee is acceptance. There’s no medical and they won’t even ask health questions. Apart from the obvious, do you smoke? We all know that’s going to hike prices. Terminal illness cover built-in. If you take terminally ill, you have the option to claim the full cash value of your policy before you die. Should you take seriously ill, but not terminal, there’s an option to claim 20% of your cover. If you’re involved in a fatal accident, the cash sum that would be paid gets tripled. Full support services are provided to customers free of charge. You stop paying premiums at the age of 90 (Remember the OneFamily Over 50s Plan is a Whole of Life Policy). Buy online and you’ll get a 5% discount. The text in bold above are key differentiators for OneFamily in comparison to most other life insurance providers. The OneFamily Over 50s Guaranteed Plan has an age cap of 80. You must be between the age of 50 and 80 to be eligible. While cover starts from £8 per month, they can be as high as £75 per month, depending on your situation and the amount of insurance you want covered for. Full cover only begins after you’ve been on the Over 50s plan for two-years. Should your death happen within the first two years of taking out the policy, the cash sum won’t be paid but instead, OneFamily would pay 150% of the amount paid to them. When taking out a OneFamily Over 50s Guaranteed Life Cover Plan, customers are given the option to add “for free” an extra £250 Funeral Funding Option. Sounds enticing, and most likely wouldn’t bat an eyelid. Yes, please. I’ll take that, thank you very much. But, the catch is that the £250 is paid directly to the Co-Operative Funeralcare to put to the cost of your funeral. That ties your family into an agreement that the funeral will be through the Co-Operative. They operate a funeral care plan where you can pay the cost of your funeral and make your own plans. With this extra £250, you don’t get to make your own funeral arrangements but you do get the promise that it’s the Co-Operative who will receive the £250 and whatever it costs for your funeral, that’s the company your family pay. 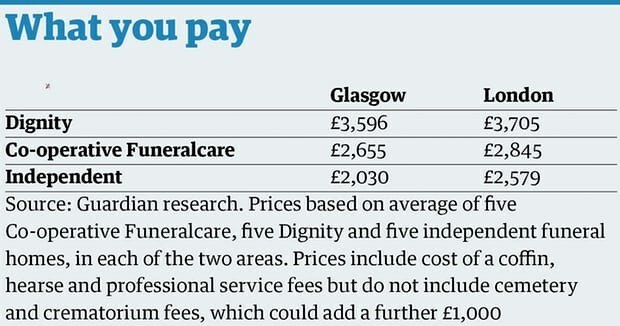 Back in 2016, the Guardian newspaper researched the cost of funerals with funeral plan providers and compared those with Independent Funeral Directors in two cities. Glasgow for Scotland, and London for England. In both cases, two of the largest funeral plan providers charged more than a local independent Funeral Director would have charged therefore think carefully about whether you want to commit your family to a service. The £250 will not go to your family. It’s paid directly to the Co-Operative to put toward the funeral cost. Judging by the figures above, it’s likely going to cost them more. Do not assume that because the topic of funerals is brought up that it’s included in your cover. It’s not. Whatever cash is paid out to your family from your life insurance policy, some of it will need to be used to pay for funeral costs. It is possible that you may not have enough insurance to cover that expense, in which case, your family would be required to pick up the cost. The cash sum of your policy insures you for does not take into account inflation. If you take the policy out at the age of 51 years old and live until the age of 85 years old, things will be a lot more expensive at that point. From 2016 to 2017, the Royal London National Funeral Cost Index reported funeral costs rose by 3%. In that same period, inflation rose by 2.6%. If that trend continued for 34 years, it would be costing a lot more. This is another guarantee. For your policy to remain active, your payments must be kept up. It’s the same with all insurers, but for Over 50s plans, consider that with OneFamily quotes start low but can go as high as £75 per month, so take your time before agreeing to the policy. Think it through, and get advice if you’re unsure about anything. Depending on the amount of your cash sum pay-out, it could be subject to inheritance tax. To avoid your family paying a huge chunk of their money to HMRC, you may need to cough up to pay for a tax advisor to make arrangements for your estate so that the insurance money is paid out tax-efficiently. Perks are always nice. Unless it’s a free £250 that you or your family will never see anyway. However, there are some nice sweeteners OneFamily have for their customers. This is handy for those who are over 50 and caring for elderly parents, relatives, friends or others in your home. In fact, for anyone over 50 working as a carer for someone elderly would likely find it nice to have a support line to call for advice for any time you’re unsure about something. Especially considering it’s free. Many a person wouldn’t know where to start to write a Will. Once that’s done, the majority likely wouldn’t know the next step. There are Will writing services, but how do you go about getting recommendations for them when the people who have used them aren’t around to tell you of their experience? Through advice services from those who work in the industry. Ongoing support and advice service free to those diagnosed with a serious or terminal illness. It’s nice to know that if you do take ill, there’s a support service there. Bereavement help when your family need it! When you do go, OneFamily has bereavement advice services available. They don’t just send a bunch of money and close your account. They’ll follow up and offer bereavement support, or even just provide that listening ear as your family go through the bereavement process. It’s not every day that someone suffers the loss of a loved one, so they are going to need some help to navigate the process. What to do, where to go, who to phone etc. OneFamily have support services to help advise and guide people if needed. The OneFamily Over 50s Life Cover Plus Plan has a few things different going for it. The only drawback would have to be the transparency. The funeral benefit option is framed as a benefit when that’s highly based on where you live. Chances are, your family would wind up paying more than the £250 being offered from OneFamily to pay the Co-Operative.